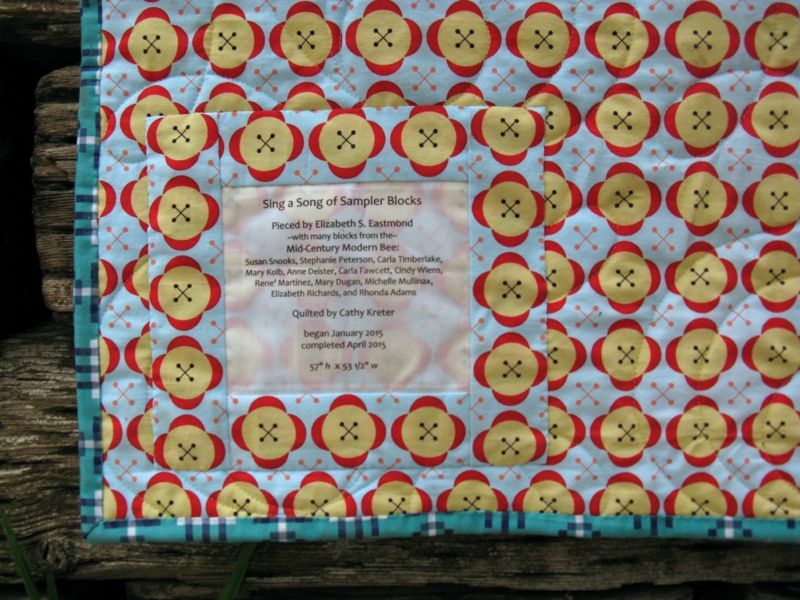 Sing A Song of Sampler Blocks | OccasionalPiece--Quilt! 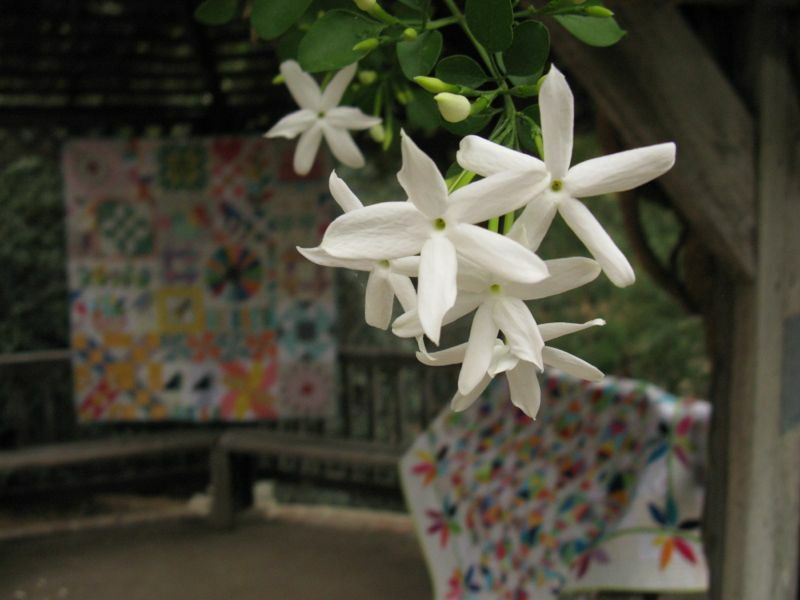 Posted on April 26, 2015 by Elizabeth E.
I went up to my university’s botanic garden to photograph these two quilts, loving the contrast of the rustic against the brightly colored blocks from my beemates in the Mid-Century Modern Bee. I put out a call for a variety of blocks in 6″ or 9″ or 12″ sizes, and then as they came in, placed them all up on my design wall to see how they played together. I used some of the ideas from these friends to create a few more blocks, following Carla’s lead when she created hers. Like Carla, I also worked in the small signature blocks as part of the design. One day I opened a card from Rhonda, another friend back east, and she’d made me a bird block to be added to my project, as she had read my blog and wanting to contribute to my modern sampler. So that spurred me on to making a few more birds as well. 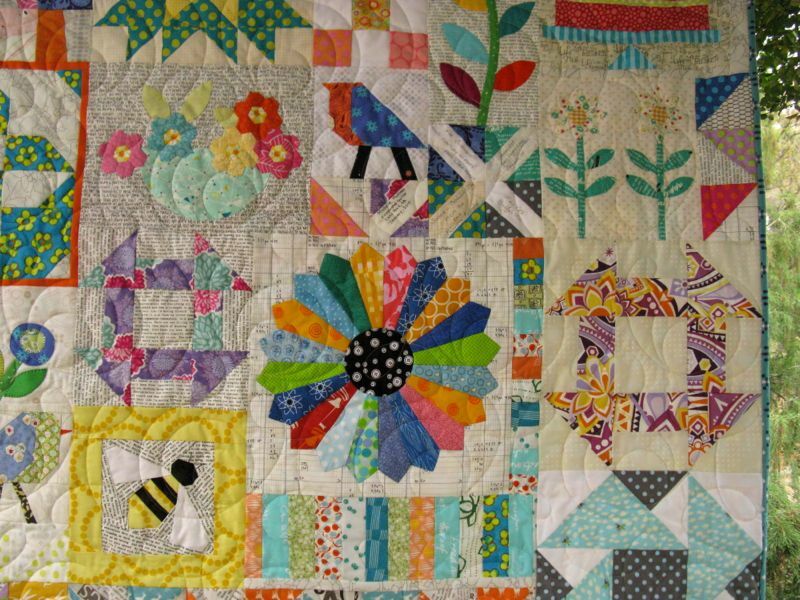 Then I had to try some flowery blocks, two different kinds to go with all the other flowers, and a Dresden block, and once I got started, I also added a Road to California block (made four times so it would be big enough to add variety). It’s kind of fun to try making all different kinds of blocks. Finally I had enough, and the right size of blocks and I was able to sew it together. Happily so, thinking about my good friends. I saved some of the smaller blocks for the back. Happy Spring! 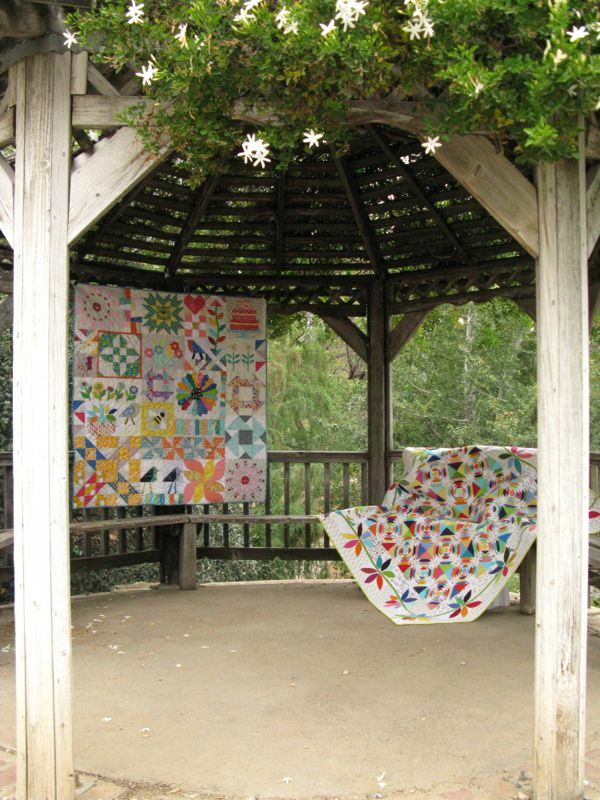 Spring into some quilting! 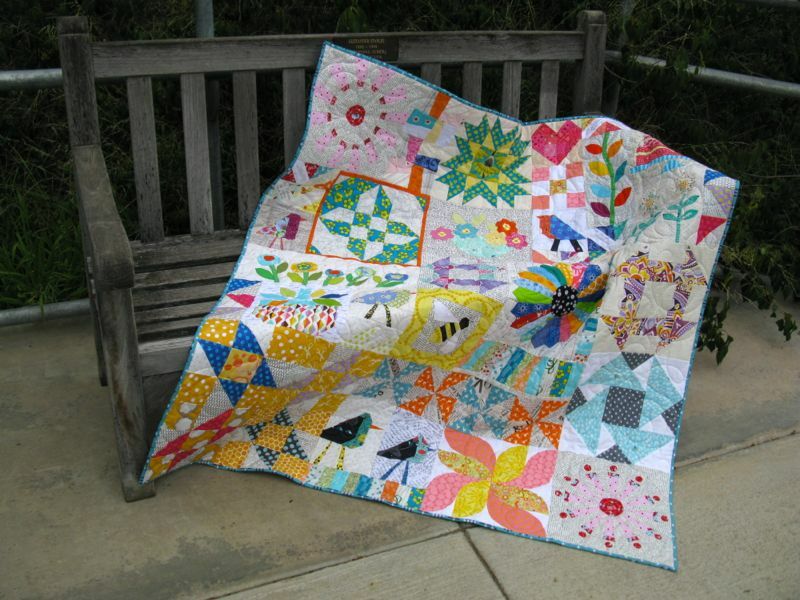 I love your Sampler quilt Elizabeth! It’s one of those quilts I could just look at for hours, with all its variety in design and colour! The way your pieced the siggy blocks was very clever and effective too! Absolutely wonderful, on so many levels! 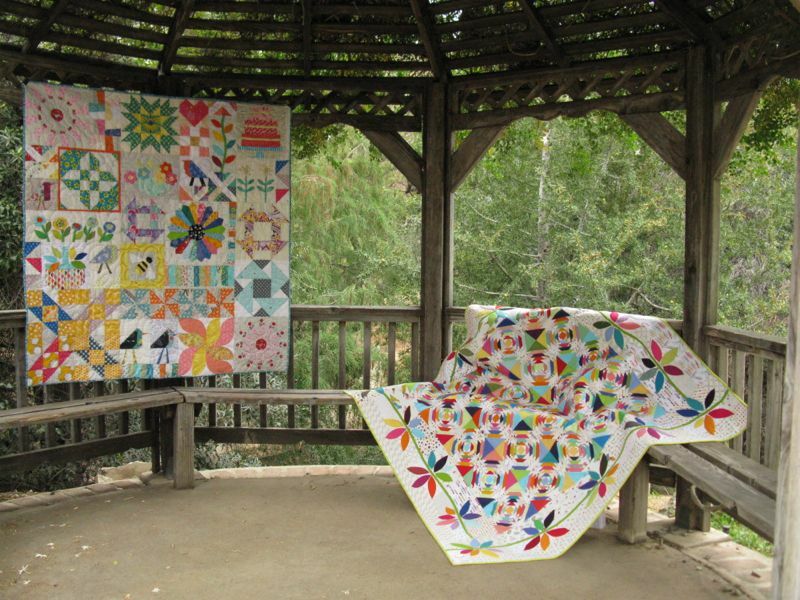 I’ve been having trouble getting inspired for a new quilt–maybe a sampler is the answer. 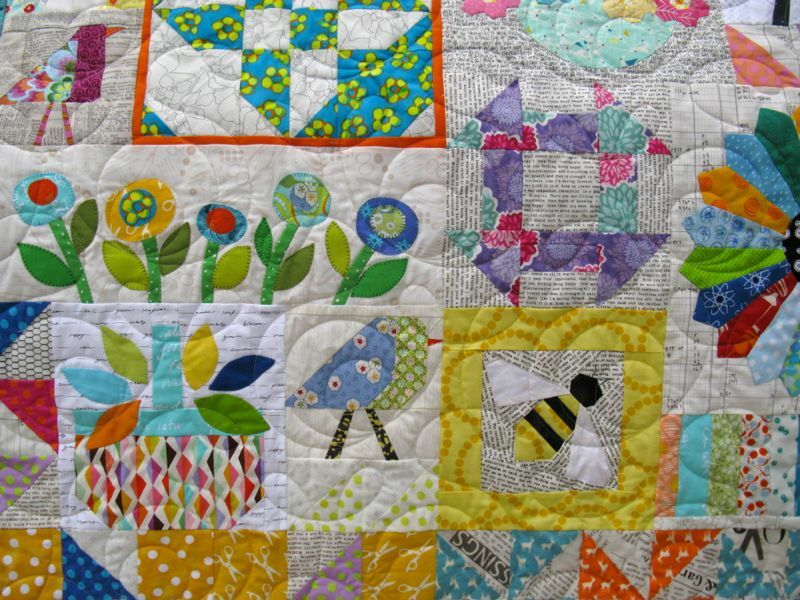 This quilt is sew joyful! Beautiful ! Wow I really love your Sing-A-Song sampler Elizabeth! It is truly amazing how they all came together. I love the scrappy look. And yet it is still very unified in its style. Still amazed by your work! Well done with all the photos and thanks again for sharing! It turned out so lovely Elizabeth! I am proud to have a little part in creating this! The sampler is another beautiful quilt. The colors all blend so well and your block arrangement is wonderful. I love the combination of different sizes as it makes a sampler so much more interesting. The quilting, binding and labeling it makes a perfect finish. It’s so very fun to look at. Happy it all went together so well. Just lovely. I love the combination of geometrics and objects–bees, blooms, birds, and baskets. Beautiful! 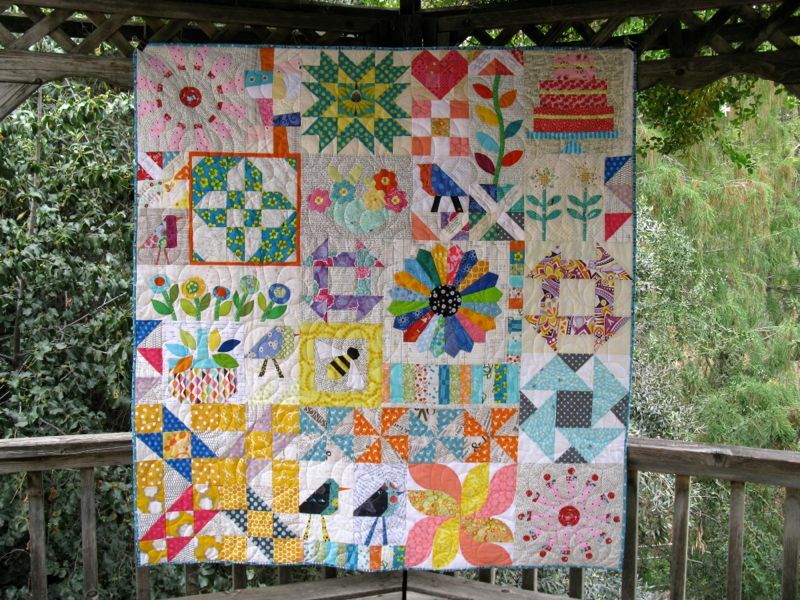 Such a bright and colorful quilt sampler. I love it, Elizabeth. 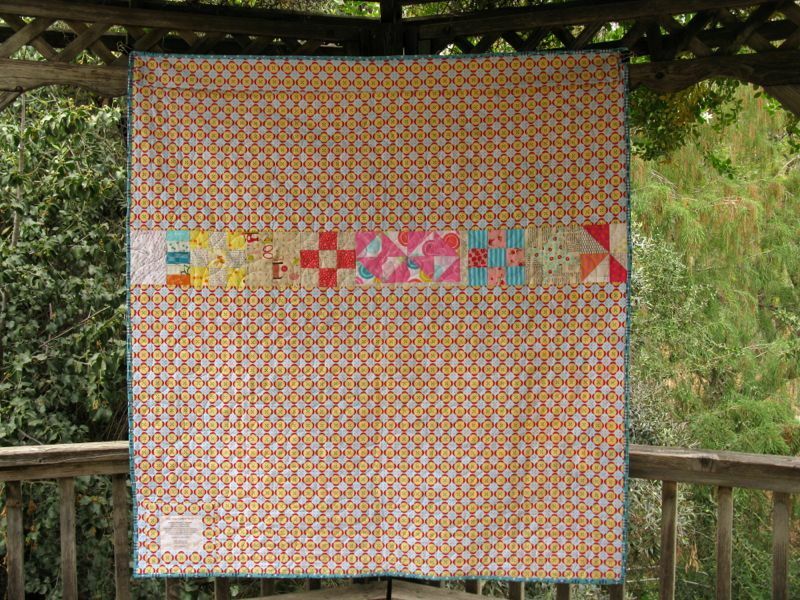 What a great sampler quilt. And having bee-mates contribute was a nice enlarging idea. I especially like the birds and flowers, though they need the traditional blocks to shine. 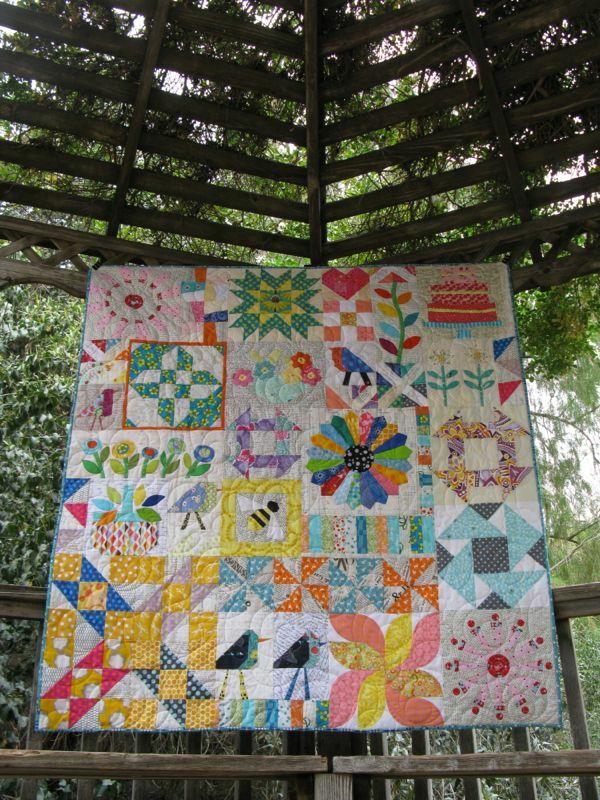 I have completely fallen in love with your sampler quilt and i get the itch in my fingers to start one too! Yours is so so beautiful!